The demands on compliance functions are increasing, but budgets are not. An interesting and insightful study on the challenges in compliance and a suggested path forward. Nice work to the Accenture team. Upsetting the pace: More than external regulations, the pace of business change via acquisitions, new products, and technology are placing a higher burden on compliance teams than ever before. Compliance organizations are recognizing the need to reinforce the control framework around a more technology-driven approach to business through the appointment of a technology compliance officer. Re-stating “The first line of defense”: Compliance activities are being re-distributed across the organization. Compliance activities generally in the purview of the compliance team are now being shifted to the first line. In other words compliance is becoming an enterprise wide effort versus an effort isolated to the compliance team. Pivoting and adopting the new: The pace of change and the broadening of compliance work demand that organizations pivot to new technologies. Organizations need to adopt new technologies with their flexible architectures to keep pace with the business, regulatory, and organizational change. Empowering a new generation of compliance officer: Unmanaged employee attrition is well above expectations. Knowledge loss and constant changes in compliance staff result a “re-creation of the wheel” effect that consumes productive time. Organizations need to re-envision the compliance function. Technology will be critical to supporting and changing the compliance role for the better. 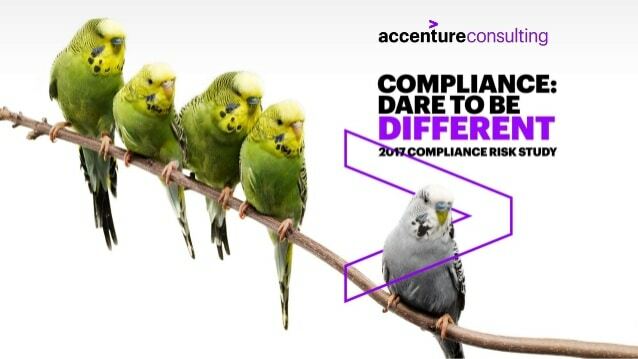 Accelerating to Compliance 2.0: Risks are compounding and organizations continue an incremental approach. It is time to be bold versus incremental. Re-thinking compliance from a technology, organizational, and people perspective is critical to changing the result.